T91/ P91 steel manufactured to ASTM A335 P91 or ASTM A213 T91 is a typical tempered martensite in term of microstructure. They can be welded by many common welding methods including SMAW, SAW, GSAW(TIG/MIG), and FCAW, etc. Metals-Piping not only provides premium-quality T91/ P91 seamless pipes and tubes but also supplies optimum filler metals(welding wire, electrode, welding rod, flux) for its welding. 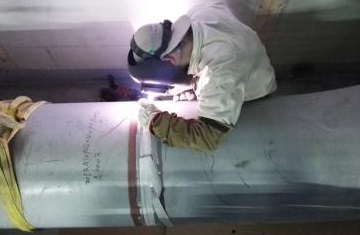 The welding of ASTM A335 P91 pipes in a power plant’s main steam pipeline, Jiangsu province, China. The P91 pipes were supplied by Metals-Piping. *AWS 5.5: Specification for low-alloy steel electrodes for shielded metal arc welding(SMAW). *AWS 5.23: Specification for low-alloy steel electrodes and fluxes for submerged arc welding(SAW). *AWS 5.28: Specification for low-alloy steel electrodes for gas shielded arc welding(GSAW): GTAW/TIG welding, GMAW/MIG welding. *AWS 5.29: Low-alloy steel electrodes for flux-cored arc welding(FCAW).